The ASUS VS line of monitors are some of the best out there. Thin, energy-efficient, and affordable price. If you don’t have an LED monitor, it’s time to upgrade! If you own a laptop then a laptop cooler is a MUST have. I compare the top 4 coolers on the market and show you the quietest, most powerful, and the most affordable. Does the clicking noise in your mouse sometimes annoy you? Try this quality wireless noiseless mouse! Create a beautiful atmosphere in your home with this bluetooth Mood Light. Packed full of useful features! Keep and eye on your house from your phone! All for less than $100. Check out this awesome home security camera by Foscam. One of the best Dash Cams for under $10, records 1080p Video, Speed, Location, Audio, and more! Shoots at 100fps! 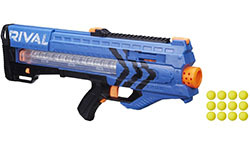 This new Nerf Gun is the flagship with lots of improvements over older guns.